See if you can spot the subtle difference. Is she carrying a Kar98?! Okay, looks like Israel still uses the M14. That’s hot. And I’ll bet the kids are more respectful too! Sorry to step on the serious point, but it’s a cute picture, above all else, and that’s what struck me. Mass shooters only go to gun free zones. I bet the parents night is nice and respectful too. Unlike some I’ve known. BTW at the moment Jerusalem is having large dose of snow, so some schools aren’t open today. Heaviest snow in 60 years. CO2 at work again? Could all this snow and cold weather be–gasp!–a sign of Global Cooling? No, abnormal cold anywhere on earth is always attributed to ‘natural variability’, whereas abnormal heat is always very specifically explained as being caused by ‘global warming that is due to man-made carbon dioxide emissions’. The IPCC climate models can always explain unusual heat, but never unusual cold. That is why they are so accurate. Apparently so the climate ‘scientist’ say the CO2 heated air backradiates it’s LWIR and melts the polar icecaps. That is what causes more precipitation and snow. That is a good old US GI M1 Carbine. Probably can have the 30 round clips for it too if she wanted them. Great weapon for up close situations where some one with out a lot of training needs to get bullets to a target easily with out a lot of recoil etc. Great little weapon within its limitations. Could be the M2 version that is full auto if needed with the flick of the selector switch. Looks like an M1 Carbine to me, too. I find it disturbing that here, as seen in a previous photo of Israeli women slinging rifles, the rifle appears to have no magazine. I should think they would carry at least in Condition 3.
armed teachers! the way to go. Interesting trigger and clip guard. I was also thinking m14, but the sling sure makes it look like an old Garand. I’m jealous either way. I like the trigger/safety guard too, pretty simple and effective. Why, no there hasn’t been any mass shootings there because the people AND TEACHERS are armed to the teeth. Israel’s a more civilised country than the USA? 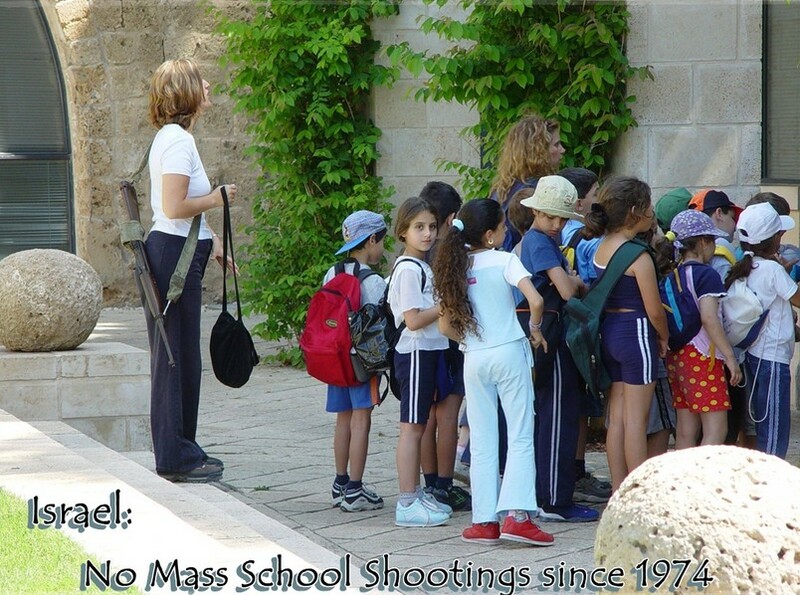 The Israelis do not have the luxury of being able to fool about with the safety of their children as the American seem to do. American is consumed with decadence. Teenagers running the government. A health insurance scheme designed in the faculty room at Harvard, by a committee that includes no people familiar with health insurance. I like the idea of arming and training teachers who volunteer for concealed carry in the classroom. It’s cheaper than hiring rent-a-cops.